Love this rug! Good quality for the price. It has held up well. This traditional brocade design has been updated with a contemporary rhythm. The favorable blend of hues creates a transitional area rug that will transcend rigid design constraints. Ivory background with gold, beige, brown, green, blue and red. Available in several individual sizes and as a three piece set so you can harmonize your theme throughout your home. It is easy to care for, vacuum regularly to maintain its appearance. Spot clean as needed with mild detergent, do not dry clean or bleach. This was our first rug to buy on Overstock.com! This rug looks lovely in our living room. The colors were even more beautiful than they looked online. It is a great quality, laid out relatively flat right away and we are so glad we purchased this rug! 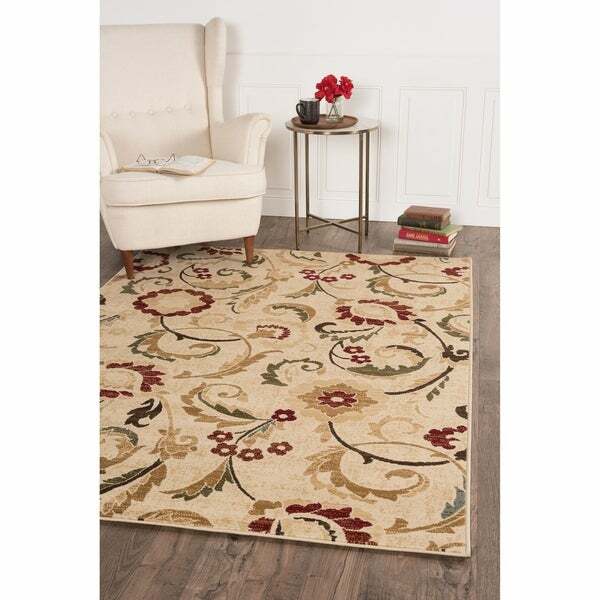 Love this alise rug lagoon transitional floral area rug. I would definitely recommend is area rug. It is easy to clean. Looks great in my living room. I bought this rug for our dining room. Great size and not too thick. Colors are vibrant but not overwhelming. Very happy with this purchase. Colors are true to picture and complement my furniture and wall color perfectly - soft yellow/golds, sage green and cranberry red colors, with small touches of slate blue. I bought this because it was one of the least expensive options I've seen in a rug this size with a pattern I really liked. Once I saw it in person though it kinda has a low-end look to it, so the get-what-you-pay-for saying holds true in this case as far as looks go. Durability-wise I've had it for a few months now with 3 crazy boys and so far there's no wear and tear issues. True to description online. IT is not very heavy so it can pull up. Would recommend having a portion of the furniture on it. Overall I thought good value for where I wanted/needed more color. I bought this area rug for my home office and it is very nice & beautiful, couldn't ask for anything more, the depth and the width of the rug is superior no shedding no pulling which is great I just love it! I bought the ivory Alise Area Rug. The image of this rug online shows a pale goldeny background with red, green and tan designs. The rug I received is mostly beige/cream with red, grey and two shades of tan designs. I bought this to coordinate with existing furnishings and it doesn't. The pile is reminiscent of felt. It is soft and was delivered on time though. This area rug is a great size for my dining room. It adds just the right amount of color to brighten up your room. Easy to keep clean. I bought this rug when I furnished a second home, and needed large area rugs. The value is great for the price - I get compliments on the size, color, and pattern. I love my area rug so much that I am going to purchase another one with blue's in it just for a seasonal change. The rug lays flat with no curl on the ends. The colors are vibrant and bright and the pattern has brightened my whole room. Rug arrived quickly, just as it was represented in picture - looks beautiful. And a wonderful price during the sale - love it. While the rug has beautiful colors, it is very thin and not well made at all. Very disappointed. I wish I had spent 60 dollars more and gotten a quality rug. I might send it back because I can't get the rug to stay flat. Do yourself a favor and skip this purchase. I wish I had. I wanted thin and smooth to go under dining chairs and table on hardwood floor. Color is the same as pictured ...more golden beige than Ivory (opinion) but fits perfectly. I didn't want high pile or texture for ease of moving chairs. It is soft and nice to walk on. As always quick to deliver so no complaint there. I ordered the ivory rug but it was very tan. Color description should be changed. Returned the rug without any problems. This rug has very vibrant colors and is a better quality than I expected for the great sale price! Plus, it’s super easy to vacuum which makes this rug easy to care for. Shipping was fairly quick too! Absolutely LOVE this rug!!! Colors are as pictured. Rug is thicker than I thought it would be. Very pleased with the shipping and the packaging for shipping. Love this rug. It adds richness and warmth to my TV room. Love the color and style of the rug for the price. I was looking for a rug with accent red and this fit the bill perfectly! This rug is awesome it a great weight, it lies really flat and it has beautiful colors and a attractive design. I bought this for a gift for my Son and he’s very satisfied with it. I’m recommending this. Love the colors in this rug. I bought it to go under our square dinning table. It’s thin but exactly what I was looking for. We have had it for over two and a half years and it’s holding up great. "Can this rug be used outdoors on a screened and covered porch?" "On the ivory called rug can you tell me what the colors are in this rug. Very hard to tell by the picture of the Alise Lagoon Transititional area rug?" "Does this rug come in a 4" ROUND?" This rug is not currently available in a 4 foot round size. "Is this rug a golden beige or a more neutral beige? Is there any sage green in the rug?" This rug is more golden beige than neutral. Also, the green is mossy green, darker than what would be called sage green. "Is that green or gray in the ivory rug?" "Is it possible to buy just the large rug in this set?" "I am interested in purchasing his Alise Lagoon Transitional Area Rug (7'6 x 9'10), It appears to have colors of ivory, green and burgundy. But the options given are blue or brown I do not see a brown rug. I see a blue one and a ivory one and a black one. I am not sure which one I need to order to get the ivory, green and burgundy one. Can you please advise? Thank you." When I bought my rug the ivory color was listed on the options menu. I believe if it is not listed it isn't available. I bought the darker color, which is actually dark brown (not black) with tiny specks of black. I love it! I have it under my dining room table. Vacuums nicely. Quite thin, but works great for me. I have no pad underneath, but I have laminate floors. Would definitely use a pad if I had hardwoods. Very good quality for the money. 8x10 for just over $*** can't be beat. I would purchase again. The colors in mine are slate blue, brown, burgundy, ivory, touch of green and gold. Hope this helps.